The divisions between Republicans and Democrats on fundamental political values – on government, race, immigration, national security, environmental protection and other areas – reached record levels during Barack Obama’s presidency. In Donald Trump’s first year as president, these gaps have grown even larger. And the magnitude of these differences dwarfs other divisions in society, along such lines as gender, race and ethnicity, religious observance or education. A new study by Pew Research Center, based on surveys of more than 5,000 adults conducted over the summer, finds widening differences between Republicans and Democrats on a range of measures the Center has been asking about since 1994, as well as those with more recent trends. But in recent years, the gaps on several sets of political values in particular – including measures of attitudes about the social safety net, race and immigration – have increased dramatically. Government aid to needy. Over the past six years, the share of Democrats and Democratic-leaning independents saying the government should do more to help the needy, even if it means going deeper into debt, has risen 17 percentage points (from 54% to 71%), while the views of Republicans and Republican leaners have barely changed (25% then, 24% today). However, Republicans’ opinions on this issue had shifted substantially between 2007 and 2011, with the share favoring more aid to the needy falling 20 points (from 45% to 25%). The result: While there has been a consistent party gap since 1994 on government aid to the poor, the divisions have never been this large. In 2011, about twice as many Democrats as Republicans said the government should do more for the needy (54% vs. 25%). Today, nearly three times as many Democrats as Republicans say this (71% vs. 24%). Racial discrimination. In recent years, Democrats’ views on racial discrimination also have changed, driving an overall shift in public opinion. Currently, 41% of Americans say racial discrimination is the main reason many blacks cannot get ahead – the largest share expressing this view in surveys dating back 23 years. Still, somewhat more Americans (49%) say blacks who cannot get ahead are mostly responsible for their own condition. “Peace through strength.” About six-in-ten Americans (61%) say good diplomacy is the best way to ensure peace, while 30% say peace is ensured by military strength. Opinions in both parties have changed since the 1990s; Democrats increasingly say peace is ensured by good diplomacy, while Republicans say it is military strength that ensures peace. Today, 83% of Democrats and Democratic leaners see good diplomacy as the way to ensure peace, compared with just 33% of Republicans and Republican leaners. The surveys were conducted June 8-18 among 2,504 adults and June 27-July 9 among 2,505 adults, with a follow-up survey conducted Aug. 15-21 among 1,893 respondents. This report was made possible by The Pew Charitable Trusts, which received support for the surveys from The William and Flora Hewlett Foundation. The partisan shifts on political values over the past 23 years have had different trajectories across different sets of issues. While there has been greater movement among Democrats than Republicans on several issues, on others Republicans have shown more change. In views of stricter environmental laws and regulations, for example, there has been a larger long-term change among Republicans than Democrats. Republicans are far less supportive of stricter environmental laws than they were in the mid-1990s, while Democrats have become somewhat more supportive. 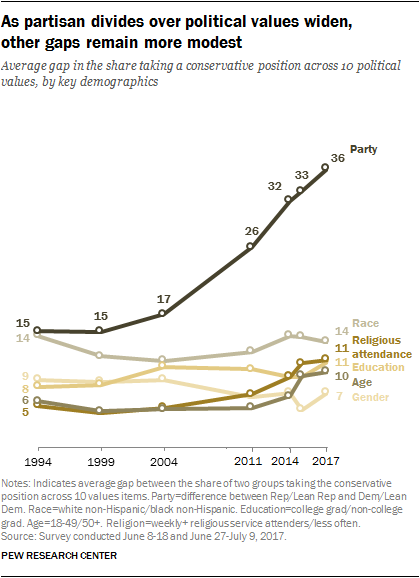 But the bottom line is this: Across 10 measures that Pew Research Center has tracked on t he same surveys since 1994, the average partisan gap has increased from 15 percentage points to 36 points. Two decades ago, the average partisan differences on these items were only somewhat wider than differences by religious attendance or educational attainment and about as wide as the differences between blacks and whites (14 points, on average). Today, the party divide is much wider than any of these demographic differences. Partisan gaps have grown even on measures in which opinion in both parties has moved in the same direction, such as support for societal acceptance of homosexuality. Currently, 70% of Americans say homosexuality should be accepted – the highest percentage ever. For the first time, a majority of Republicans (54%) favor acceptance of homosexuality; just 38% did so in 1994. Yet over this period, the increase in the share of Democrats saying homosexuality should be accepted has been much larger (from 54% to 83%). As a result, partisan differences have gotten larger. The surveys find that while Republicans and Democrats have grown further apart, there are sizable divisions within both parties on many political values. Younger Republicans differ from older Republicans in attitudes about immigration and several other issues. Among Republicans and Republican leaners younger than 30, 62% say immigrants strengthen the country; half as many Republicans ages 65 and older say the same (31%). In recent years, there has been a decline in the share of Democrats who say that most people can get ahead if they work hard. Only about half of Democrats (49%) express this view, down from 58% three years ago. A large majority of Republicans (77%) continue to say hard work pays off for most people. Democrats are divided by education and race in their views of hard work and success. White Democrats and those with higher levels of education are less likely than nonwhite Democrats and those with less education to say that hard work leads to success. Partisan antipathy remains extensive. The shares of Republicans and Democrats who express very unfavorable opinions of the opposing party have increased dramatically since the 1990s, but have changed little in recent years. Currently, 44% of Democrats and Democratic leaners have a very unfavorable opinion of the GOP, based on yearly averages of Pew Research Center surveys; 45% of Republicans and Republican leaners view the Democratic Party very unfavorably. In 1994, fewer than 20% in both parties viewed the opposing party very unfavorably. Big house, small house. Our studies of political polarization and partisan antipathy both found that the disagreements between Republicans and Democrats go far beyond political values and issues. They also have markedly different preferences about where they would like to live. 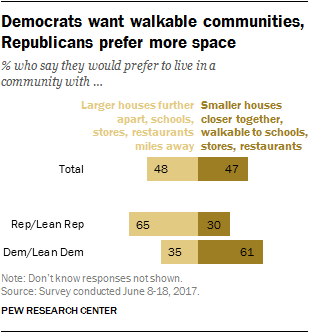 Most Republicans (65%) say they would rather live in a community where houses are larger and farther apart and where schools and shopping are not nearby. A majority of Democrats (61%) prefer smaller houses within walking distance of schools and shopping. Deep differences over factors for nation’s success. About half of Americans (52%) attribute the country’s success more to “its ability to change,” while 43% say the nation’s “reliance on long-standing principles” has been more important. Most Democrats (68%) link the nation’s success more to its ability to change, while 61% of Republicans point to its reliance on principles. In addition, there are wide age differences, with young people far more likely than older adults to say America’s success is mainly linked to its ability to change.